The menu of nitrogen sources is quite large. However, all sources are not created equal. Nor do forage grasses, like bermudagrass, respond to each source the same way. There are reasons for this. 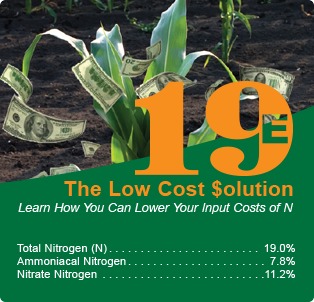 Consider these facts when choosing the best agronomic and economic source of nitrogen for your crops. Urea and urea containing sources like UAN (urea ammonium nitrate) are subject to a potential loss of some nitrogen due to volatilization (nitrogen escape as ammonia into the atmosphere). This loss results when urea and urea containing sources are unprotected. The loss is greater when the air temperature is high, under windy conditions, and where moisture comes in contact with the source to activate urease and the hydrolysis of urea. These sources can be protected with additives or by incorporation into the soil by tillage or with water from natural rainfall or irrigation. This loss can be as high as a quarter or third of the nitrogen applied. So, if possible, select sources that are not subject to nitrogen loss by volatilization or that are properly protected. Some sources contain three to five percent sulfur along with their nitrogen. This is good because sulfur helps crops to better utilize the fertilizer nitrogen. In many regions of the country and for many crops sulfur is becoming the fourth major nutrient limiting high yield crop production. This amount of sulfur, three to five percent, seems to be adequate in meeting crop needs. Nitrogen use effectiveness and efficiency are regulated by several conditions. One of these is to insure that other nutrients are readily available to the crop. Potassium and sulfur are two such nutrients that can restrict crop use of nitrogen if they are in short supply. Both are involved with a crop’s ability to use nitrogen to form quality plant proteins. A shortage of potassium is also closely associated with forage crop stand decline and winter injury. Recent emphasis on higher and higher crop yield is placing greater stress on the total quantity of plant nutrients needed and the critical growth stages when these nutrients must be absorbed by the plants. Nitrogen, potassium and sulfur are three of those vital nutrients that must be “spoon fed” to the crop. If irrigation is available, they can be delivered in the water as needed by the crop. A relatively new source on the nitrogen menu is the liquid 18-0-0-3. Research during the past three years shows it to be one of the best for forage grasses when properly applied. It contains three percent sulfur to help nitrogen to work best. It contains nitrogen in about equal amounts as the nitrate and ammonia form so quick response to forage grasses and pastures can be expected. And, another important agronomic factor is that it is not subject to volatilization loss of the nitrogen being applied. So, from an economic viewpoint, 18-0-0-3 is a low cost solution fertilizer source. It contains sulfur, the nitrogen exists in both the nitrate and ammonium forms and the nitrogen is not subject to loss due to volatilization. Availability of this nitrogen source is widespread throughout the Georgia area. Check with your local fertilizer provider for more details. Apply For Your G.A.T.E Card Now!